The T26E4 "Super Pershing" is a M26 Pershing with upgraded protection in the form of spaced armor scrapped off from one of the Panther tanks. It is analagous to the M4A3E2 Sherman Jumbo in that it is the up-armored variant of a mobile medium. 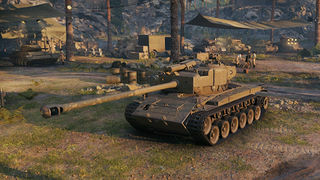 The T26E4 does not however have access to the upgraded engine or the long 90mm of the M26 (although as of 9.17, AP penetration is similar to each other), but does have the similar but historically-accurate long 90mm tested on the tank. The turret face of the T26E4 has very good durability to complement the tough frontal hull. This makes it nearly impervious to HE shells from the front, and allows it to hold positions or assault them reasonably well. The armor, while very tough, is not completely immune to gunfire. The T26E4 has three large weakpoints: the turret cheeks under the "ears" formed by the additional armor welded on, the commander's hatch and the long viewing port on the right side of the hull. Shots entering here will penetrate and deal damage. However, these weakpoints are covered up nicely when hull-down on a reverse slope. The T26E4 is very slow for a medium tank and is especially vulnerable while climbing hills or when it has found itself to have been flanked. While it is claimed to eat HEAT shells, it is an complete lie as tanks that has about 330mm+ of HEAT pen can reliably penetrate the upper hull arrmor and the lower hull armor reliably - such as the T-54's HEAT Rounds and the M103's HEAT rounds. This, coupled with the T26E4's sluggish turret traverse, means it will often be easily flanked, where its much thinner side and rear armor can be engaged. Likewise, this means the Super Pershing will not be able to flank most opponents, forcing you to fight enemies head-on but at a reasonable range where it will be more difficult for them to aim at the Super Pershing's weak spots. 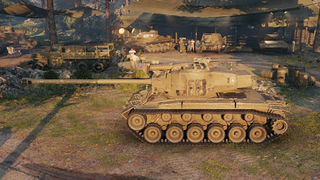 The T15E1 gun has average accuracy, and lacks in alpha and DPM to face most heavy tanks. When playing the Super Pershing, great care must be taken to aim for the weakpoints on enemy armor and to keep the three weak spots hidden or constantly moving. - Very strong frontal hull armor, the best hull frontal armor profile in tier (and one of the best in the game). - Reduced damage from HEAT/HE rounds from the front due to layers of spaced armor. - Good gun depression, and even though the T26E4 has low mobility, charging at a person can totally screw their aim up from fear factor. - Good AP penetration and very high APCR penetration. - Preferential matchmaking (tier 9 max, no tier 10 battles). - If played right can be quite a good credit maker and quite economical due to it's low Standard Ammo Cost and low Repair cost. - Mantlet is virtually unpenetrable, unless an Very high APCR Penetrating round hits. - Angling the frontal armor too much leaves your soft side armor exposed unless covered by obstacles. - Weak engine, weaker than upgrade on M26 Pershing, making it very sluggish; artillery magnet. - Gun gets knocked out frequently; facehugging is a bad idea. - One of the worst overall dispersion values. - The gun's accuracy is rather unimpressive and you often miss shots from long ranges and sometimes even mid range shots don't even hit. The front of a T26E4 is a serious challenge to inexperienced players and tanks at a distance. The front is virtually immune to high-explosive or HEAT shells (Assuming it has lower than 330mm+ penetration), due to the mass of the turret armor and the very well-sloped spaced armor on the front. Under no circumstances should HE or HEAT rounds be fired (unless you fire 330mm+ penetration HEAT rounds) at the front of the Super Pershing, aside from weakspots. The T26E4 is similar to the M26 Pershing in many ways, such as shape and armament; however, the T26E4 suffers a significant decrease in speed and mobility as it uses a very strained 500 horsepower engine that makes it slow while turning, accelerating, and going uphill. Speed is definitely not the T26E4's strong point. Another downside is the very weak sides and rear of the T26E4 which, when combined with sluggish mobility, make it very vulnerable when flanked. Although very difficult to penetrate at a distance, an up-close T26E4 can be more easily dispatched by enemies that are familiar with the T26E4's numerous weakspots. The most commonly exploited weak spots include the commander's hatch, viewing port and turret ring behind the armour. Face-hugging in a T26E4 is not usually advised - it will be easier for opponents to avoid your strongpoints. Nevertheless, at a medium range, the Super Pershing's frontal armor is resistant to nearly every gun it can see, and the frontal weakspots become very difficult to hit. A T26E4 must be very aware of its surroundings and keep its weak spots and sides protected to fully utilize the potential of its armor. 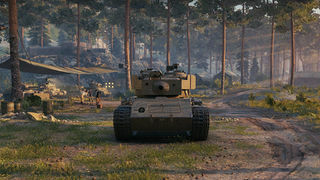 Whereas other mediums may be speedy, thinly armored, and rely on flanking maneuvers and wolf-pack tactics, the T26E4 finds itself better suited to playing as a breakthrough tank. Since patch 9.17, penetration was buffed to 192, and gun handling is usually acceptable given the slow speed. An alternative to targeting weakspots while in a T26E4 are its premium rounds which boast greatly increased penetration. These rounds often exceed the armor-penetration capabilities of non-premium Tier 8 medium tanks. Furthermore, as with most American vehicles, the T26E4 has great gun depression which allows it to hull-down and use cover comfortably. It is advised that the Super Pershing attack in a group with heavies when possible and, if available, exploit terrain features using its excellent gun depression and turret armor. When this is not practical, the frontal armor of the Super Pershing is generally superior to that of any tier 8 heavy, allowing the Super Pershing to take an aggressive forward position and absorb heavy fire for its teammates. The durability of the armor also affords the T26E4 the luxury of being able to expose itself out in the open for greater periods of time, giving you the opportunity to fully aim and ensure accuracy. This page was last modified on 25 March 2019, at 08:16. This page has been accessed 627,083 times.